To avoid scaring too many clients, BofA is clearly unhappy with its existing model, and in a Friday note writes that it is introducing a new big data recession probability model that accounts for a broader basket of indicators: the 3mo-10yr treasury spread, building permits, commercial & industrial (C&I) loans, S&P 500, real consumption, and corporate spreads. 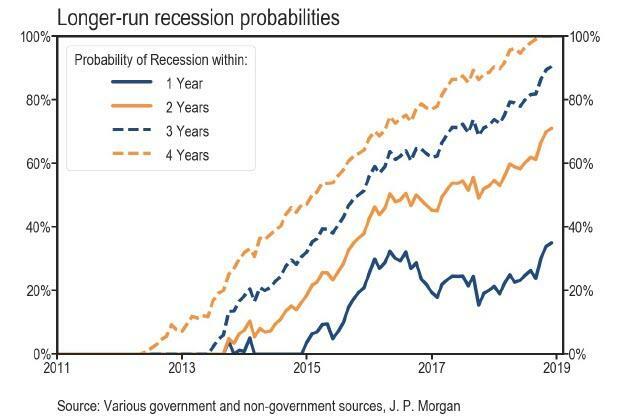 According to this model, the risk of a near term recession is far lower, predicting a 6-mo ahead probability of only 9%. 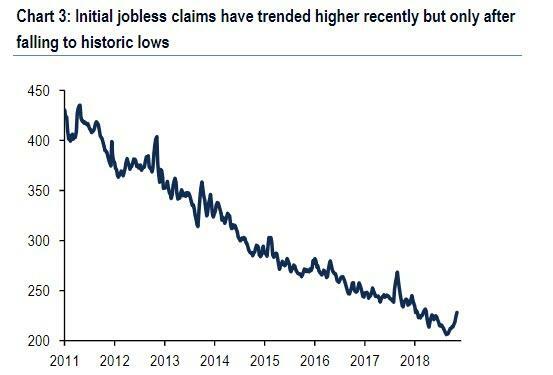 To underscore its (still) bullish bias, BofA urges clients to keep an eye on jobless claims which are among the five most relevant indicators of a coming slump: "In the last seven recessions, the 6-month growth rate of initial claims has, on average, jumped double digits heading into the recession." That said, claims have trended higher recently, with the 4-week moving averaging increasing from 206.5k in late September to 228k as of the latest data. 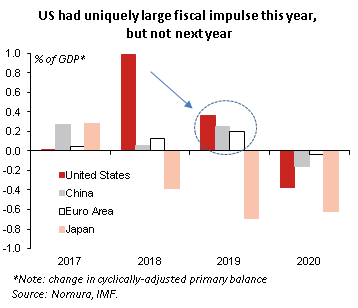 While BofA observes that this is a noticeable upward trend in a short period of time, "it looks less frightening over a longer-period and part of the uptick can be explained by noise around holiday periods." Still BofA will continue to monitor claims as it has shown to be one of the best recession indicators and notes that "increasing claims would portend a slowing in hiring and rising unemployment. In our view, sub-125k on nonfarm payrolls would likely be sufficient to push the unemployment rate higher, which is a clear signal that the cycle is turning." Bank of America’s other top recession indicators are auto sales, industrial production, the Philadelphia Fed index, and aggregate hours worked. Some of those are weakening, but none are falling off a cliff according to the bank. Another early indicator of a recession is business sentiment, which has softened recently, and is one reason for the increase in JP Morgan’s recession-predicting index, which is “getting close to the highest levels of the expansion so far,” analyst Jesse Edgerton says. The cycle peak came in 2016 when growth and markets wavered. “The risks are drifting toward the economy being softer,” Edgerton said, adding that surveys aren’t uniformly weak, and his team still isn’t predicting a 2019 recession. 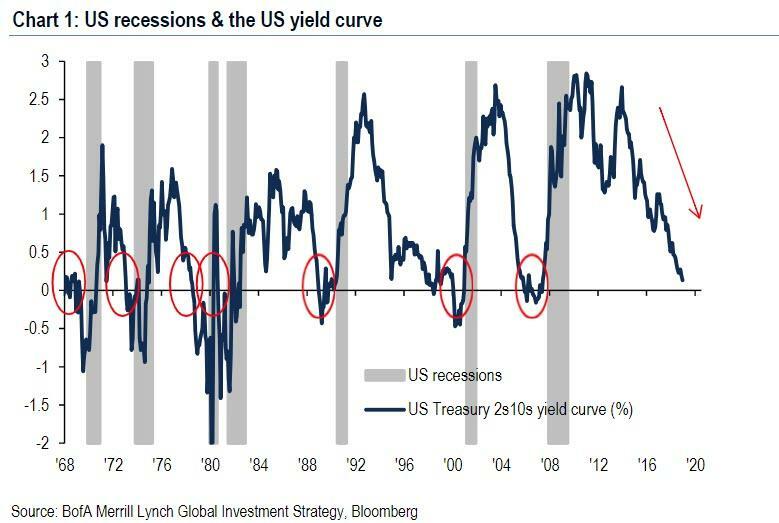 The third, and most relevant pre-recession indicator is of course the yield curve, for one simple reason: all the past 7 recessions were preceded by a yield curve inversion. "We hardly have any empirical regularity that’s this regular," said San Fran Fed President Mary Daly said in a November interview. Curiously, even with the 2s10s just 13 bps away from 0, Fed officials so far don’t sound overly concerned about the curve. They’re monitoring it, but they aren’t willing to focus on it exclusively so long as real economic data hold up as Bloomberg notes. There is also the question of timing:while a yield curve inversion virtually assures a recession, the timing remains unclear, prompting UBS Global Wealth Management’s Chief Investment Officer Mark Haefele to write in a Dec. 5 note that inversions are a "flawed crystal ball" as the lag between inversion and recession was longer than 24 months on the last two occasions. And yet, despite the cautious optimism from the sell side, the Fed’s own Survey of Professional Forecasters is starting to sour on the economy’s prospects four quarters from now: the Survey puts the odds that economy will be shrinking in a year’s time at 23 percent, the highest level since 2008. Even so, this implies a recession probability of less than 20% according to a Goldman Sachs analysis, with the vampire squid calling forecasts pretty inaccurate that far out, and respondents put a low probability on a recession within the next couple of quarters. In the end, as Bloomberg notes, markets and hard data are clearly diverging in their signals about recession odds as of this moment, with most economists - still stuck in a hopium mood - clearly sticking with the latter until a more decisive shift becomes obvious. "The incoming data continues to be good,” Deutsche Bank’s perpetually cheerful Torsten Slok wrote last week: “Where is this recession the market is so worried about?" Well, according to some it has already started... and judging by the market, traders don't exactly disagree.